You probably have some jewellery at home that was given to you by a family member or older relative. Chances are, you think that you will never wear them, because they were made when the fashion was different. Here is an example of a traditional type or earrings that got a fresh new look, by making a new design using only the existing gemstones. 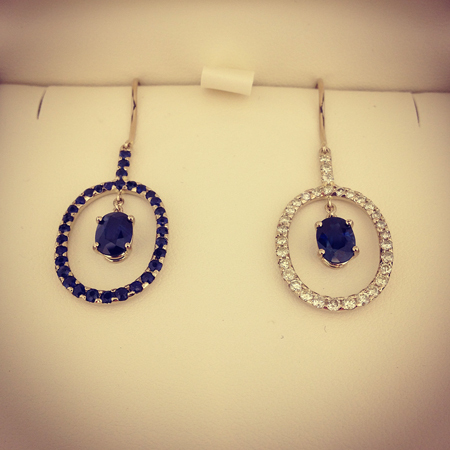 Faye liked the Sapphires and she wanted a pair of earrings, but other than that, these earrings were not at all what she would want to wear. 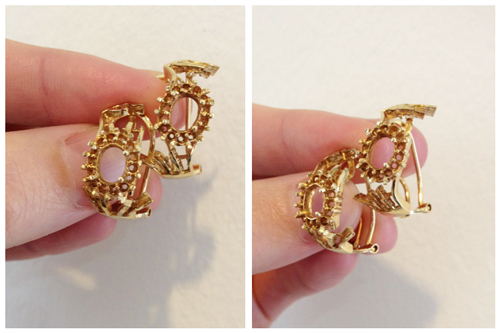 The empty earring casings that were left after resetting the gemstones into a new pair of earrings. We suggested to jazz things up a bit by setting the smaller Sapphires on one side, and the Diamonds on the other. A pretty daring choice – but with the centrepieces matching, the result is not too crazy. Instead, the result is a very elegant pair of earrings. Modern, but with the Original White Gold colour giving it a touch of vintage glamour.